Is Your Robotic Torch the Workhorse it Should Be? It's not enough to just have an automated welding process. It needs to produce. It's not enough to have an automated welding process. Yes, it saves time and money over traditional manual welding applications, but is it producing enough? 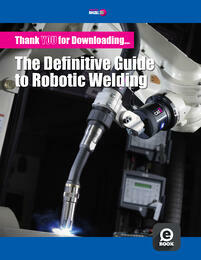 If you're looking to evaluate your Robotic Welding Torches, you'll want to download this eBook.